Dimitrovgrad in Haskovo Region, Bulgaria. Location: Dimitrovgrad is well-known industrial and agricultural centre and one of the youngest towns in Bulgaria. It is located by Maritsa River 220 km southeast of Sofia and 13 km north of the district town Haskovo, 100 m above the sea level. History: The town was founded in April 1947. It came into being through the merger of Rakovski, Mariyno and Chernokonyovo villages. The last village was known as Maluk Batak (Little Batak) in the past due to the suffering of the local population in the struggle against the Ottoman invaders. The town was named after the Bulgarian politician, statesman and General Secretary of Comintern in 1935 - 1943, Georgi Dimitrov. The town was built by thousands of young people called “brigadiri” (members of a brigade) and part of them settled it. Dimitrovgrad became an important industrial centre with many factories and plants. It also developed as vegetable growing centre, the second largest in Bulgaria, after Plovdiv. The town is connected with the life and works of the famous poet Penyo Penev (1930 - 1959), who did glorify the life of the workers. That’s why he became famous as the “poet with the quilter jacket”. Sightseeing: The visitors can see the Museum of history, the House Museum of Penyo Penev, the Art Gallery, the first planetarium in the country “Jordano Bruno” and “St Dimitar” church, built in 1880 – 1884. 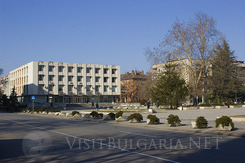 Dimitrovgrad is one of the greenest towns in Bulgaria. There are more than 4 500 decares of parks and gardens. Maritsa Park, Vaptsarov Rark and Penyo Penev Park are very picturesque and are pleasant sites for rest and relax. Vicinities: 15 km southeast of Dimitrovgrad the Sanctuary of the nymphs is situated. It is Thracian monument of great cultural importance and consists of cult-related buildings, amphitheatre, and impressive architectural decisions uniting tree natural springs. 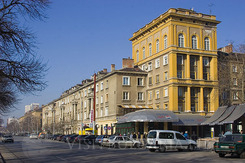 Haskovo Mineral Baths are 20 km southwest of the town.